In September 1936, Dad was living in Alvord, Texas, on Hubbard Street at the edge of town. There were no house numbers back then, he recalls. His aunt Ovie and uncle Bunk who lived in Petrolia, Texas had made plans to take Dad and his cousin Jimmy to the state fair in Dallas. Dad was about 10 1/2 and Jimmy was about six months older. Uncle Bunk was a tailor and had a shop in Petrolia. Dad said that the night before, Uncle Bunk had driven his family down to Alvord to be ready to leave for Dallas the next morning. The day of the trip, Grandma cooked them a breakfast of fresh eggs, sausage, biscuits and gravy to get them on their way by 6:30 AM. Dad was excused from his usual milking chores that day. They rode in Uncle Bunk’s new 1936 Ford 4-door sedan (“He probably give $600 or $700 for it, brand new.”), taking a route through Rhome, Roanoke and Lewisville. Dad remembers driving though farm land until they could see the skyline of Dallas. 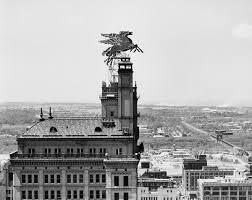 The flying red horse, Pegasus, was then the tallest thing they could see atop the Magnolia Building on Commerce Street. They pulled into Fair Park about the time the fair opened at 9:00 AM and paid about 50 cents to park for the day. He remembers spending much of the day looking at the livestock and farm equipment exhibits. He recalls also spending a great deal of time in the Car Barn where the hottest thing was the new Hudson Terraplane. At the livestock exhibit, he remembers seeing sheep, goats, hogs (white Ohio or OIC, Pollan China that were white with black stripes, red Duroc and others), chickens (Plymouth Rock, White Rock, Leghorn and more), dairy and beef cattle and rabbits. It was here that he saw his first Brahma cow and bull. At lunchtime, they bought Orange Nehi drinks and brought them out to the car to eat their lunch. He thinks the drinks were 5 cents, if you agreed to return the bottle. Grandma had sent them four sack lunches containing more sausage and potato biscuits and another biscuit with melted butter and jelly, which they ate under the shade of some trees by a lagoon or lake nearby in the park. At some point, Jimmy and Dad walked into the Cotton Bowl. “It was the largest grandstand I had ever seen.” he says. They were amazed at the size of it. They also toured the Midway, though they did not ride any rides or play any games. I asked him how much money he brought with him and he remembered bringing 4 or 5 quarters to spend for the day. He said that rather than spending it all on the rides in the Midway, he decided to use his instead on ice cream, cotton candy and drinks. They stayed until they were tired of walking and about 5:00 or 5:30 PM, they drove down to Oak Cliff to spend the night with the a family they had known from Chico. Aunt Ovie and Grandma had gone to high school with their daughter, Shann. The father worked at the huge Sears building on Lamar, just out of downtown. He says that Aunt Ovie had warned him on the trip down not to embarrass them by sopping his biscuits in the gravy at breakfast but that Shann came over to the nook where he and Jimmy were eating and told them it would be okay to do it. After breakfast, they loaded again into the Ford and returned home to Alvord. Dad says that it was not the first time he had been to Dallas, but was probably his most memorable trip for many years. Thanks, Ernie. Dad and I had fun getting it all down on paper. We’re going through his WWII memories now. Dad’s Trip to the State Fair in 1936. A really cool story of the past. I remember growing up in Waco in 1953, and while not as primitive as in 1936, Waco was still a small town. Most stores and homes had no air conditioning, and store who had the AC had a sign on the window “Come on it, we have cool air”, and soft drinks were 5 cents, large candy bars were 24 cents for three, The movie was 50 cents, gas was 19 cents a gallon, when you went out the door of any store, the clerk would say “Y’all come back now, ya hear”. Texas Friendly was spoken in most stores and businesses. When I graduated Waco High School in 1961, the school was not air conditioned. The heat never bothered me, the swarms of gnats were hard to tolerate. All the girls wore dresses, and many of the boys wore a tie. These were easy carefree times. Thanks for the comments, James. Waco had not changed that much by the time I moved there and was still a great place to live. Were you living there when the tornado hit? Yes, I was living in Waco when the Tornado hit the downtown. My father went downtown to help with the rescue effort and it was my introduction to photography. I used my box camera to shoot one roll film. Wow. I would like to talk with you sometime about that. I have read the Waco newspaper accounts several times, but only know one person who lived there then, other than you, and he was close, living on Webster. There really is not much to tell you. I was eleven years old and a typical dumb kid 🙂 at the time. We were living on Like Waco at the time of the Tornado and all we got was super heavy rain. We were able to do and see the damage after the streets were cleared for walking but not driving to see all the damage. Great story. I’ve always loved listening to Uncle Banny’s stories from yesteryear. Always so interesting.